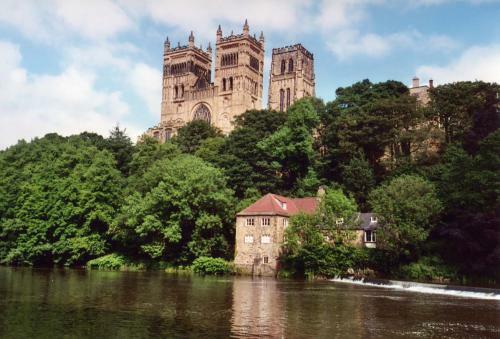 Durham, in the far North of England. A city most well known for it's medieval Cathedral (above), but very much a university town. It's not a campus based university, but the city is so small you can walk between the two furthest out colleges in 30 minutes (yet still some find it difficult to get to lectures on time!). Out of term-time the population falls dramatically as the students leave, and surges again when they come back. 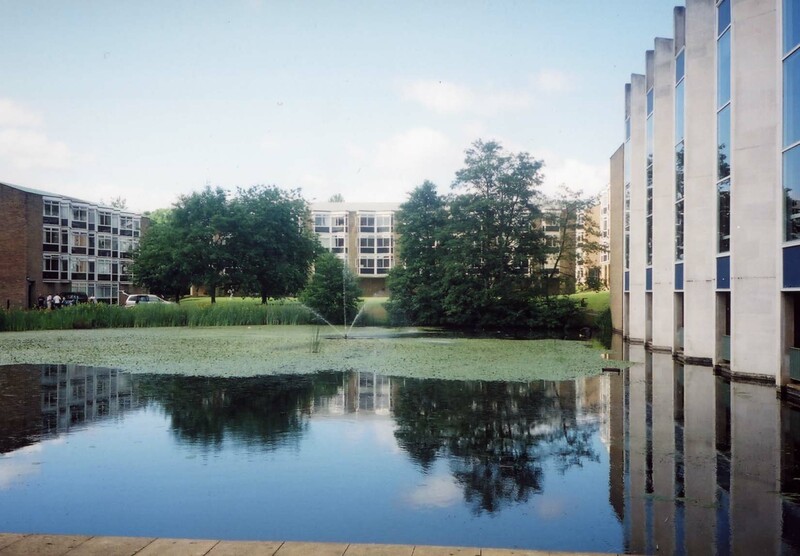 The university is an undeniably huge part of the place, and one of the most unique aspects of it is it's college system (one shared with Oxford and Cambridge only in England). Durham, as a city has 12 (soon to be 13) undergraduate colleges, and one postgraduate college. The university technically has 2 more out at Stockton (which is campus based), a smaller area outside Durham that offers different subjects to those of the city (medicine for example). You don't study within your college, but you do make your home in it, usually in the first and final year of your course (living out in rented accomodation during the others). It is also a closer-knit community with college-based societies and events, than the university as a whole would be. I don't know much about the Stockton campus colleges, so won't mention them much here. 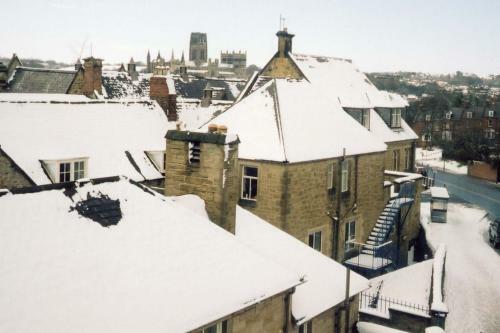 Those within Durham can be roughly split into the Hill colleges and Bailey colleges. These are all nearer to the Science site, which houses all the science departments of the university, and where most of the lectures for science students are held. The department for Middle Eastern and Asian studies is also on the hill, the majority of which is attended by foreign (and often postgrad) students. It's a longer walk into the centre of town and the shops from these colleges, but as they are away from the crowded streets and terrace houses they're buildings a lot larger, and the college itself more open, in the more 'countryside' area of the city. These colleges are on the Bailey, which is simply the long road down by the Cathedral in town (on the opposite side to the river by the picture above). They are generally older, more traditional. They are also just down the road from the centre of town, closer to the arts departments, the students union, and Elvet Riverside, a site of most art students, and some science students, lectures. However for this, the colleges are mostly smaller (except for Castle and Hatfield - though these are still more contained than the hill colleges), being conversions of the terraced houses along the Bailey. Castle college gives some students the opportunity to live in the castle, though to be warned the vast majority do not, as while it's big, it wasn't designed for the purposes of housing hundreds of students. So most find themselves also in accomodation along the Bailey houses. Neither a Bailey nor a Hill college. It is also near to town and Elvet Riverside, as the Bailey, but is outside the main town center, giving it more room to spread out with lawns etc in the way of the hill colleges. It used to be two seperate one's, hence the name, also making it the largest undergraduate college by far. However, it is yet further from the science site than the Bailey is. Although still a shorter walk to town than from the Hill. 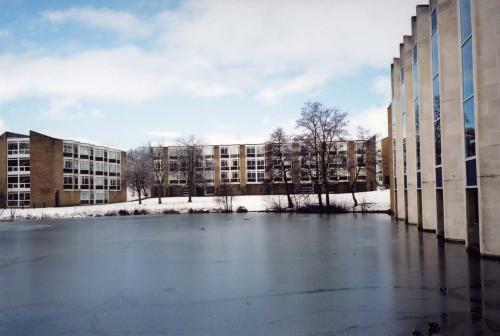 A view of some of the buildings of Hilde and Bede (note that it's a lot bigger than this though! It stretches further down the road behind us, as well as down to the river on the opposite side to the road). Coming soon - with pictures! 2006-01-12 [hedda]: That castle collage looks really cool! 2006-01-12 [shotokan_gal]: Such is the general consensus. Hence why it gets 8 applicants for every place (last time I heard anyway)... but they've easily got the best bar! (when you can get into it, which is seldom). Hmm maybe I could add that, an evaluation of college bars... though that would really only interest people coming here. 2006-01-12 [hedda]: No, bars are always fun to see! ;-) Take some pictures of you dancing on the tables and stuff! 2006-01-12 [shotokan_gal]: Dancing on tables? You must be thinking of someone else :P Nita perhaps? Anyway... We actually went on a 12-college bar crawl last term (although only got into 10). But the people are more prominant in most of the pictures from that, rather than the bars, and none of those are scanned at the moment, since they're distinctly average. But I'll see what I can do... ;) maybe some bop costumes and planet of sound photos while I'm at it, to make a general 'social' section.